The Ellie flower with crystal leather dog harness is adorable and comfortable for your dog to walk in. The leather flower is completed with the shine from a genuine Swarovski crystal in the center and the detail of the painted edges. Simply close the nickel buckle on the leather straps to fit your dog's neck and girth and know your dog will be secure. Attach the leash to the nickel D-ring that sits on your dog's back. The harness has a nickel O-Ring located by the neck buckle loop to attach ID tags. Choose the color of the harness, the color you would like for the flower and the color of the stone. 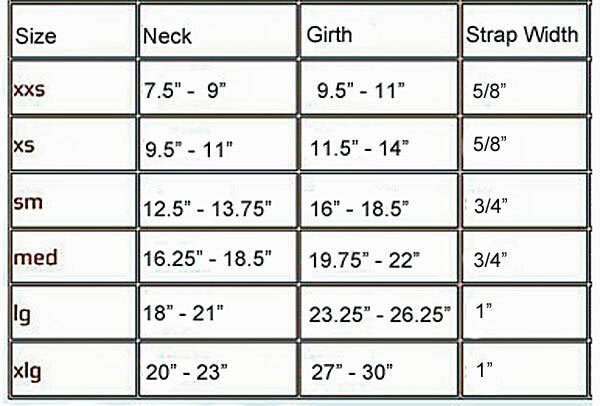 Sizes: XXS, and XS have 4 holes (neck) and 5 holes (girth) and are 1/2" apart. S, M, and L have 5 holes (neck) and 5 holes (girth) and are 3/4" apart.